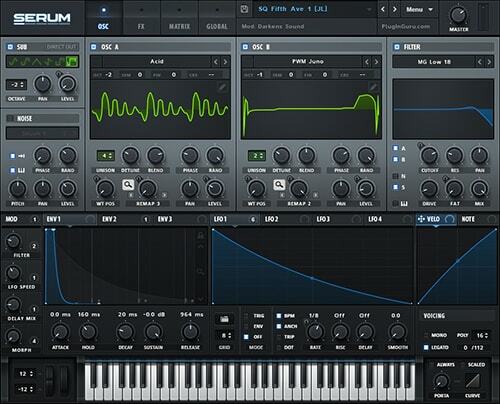 This is FX version of Serum by Xfer Records. It is used as a sound processing plugin to spice up any track whether it's a vocal, guitar, piano or soft synth! With SerumFX you can greatly improve the sound of any instrument! You will love this plugin! An effects rack with 10 effects modules (EQ, Filter, Hyper/Dimension, Distortion, Compressor, Reverb, Chorus, Delay, Flanger, Phaser) lets you get a perfect finished sound. Effects can be re-ordered to any configuration you want. Virtually all effect parameters are also available as modulation destinations. For example, apply an LFO to control reverb size or dry/wet, or velocity to control distortion amount. Many of these effects and modes were built just for Serum, so there are many unique effects to choose from, such as Hyper, which simulates (additional) unison amounts, or a dual-waveshaper which allows for a distortion you can morph between two separate wave shapes.